The Venice Biennale has started and it is on until november! ABOUT A WORKER VENEZIA will be showcased for the next 6 months at VENICE DESIGN, an international design exhibition happening during the Venice Biennale of Architecture at Palazzo Michiel. On May 24th was the opening night, here are some insights of the evening! 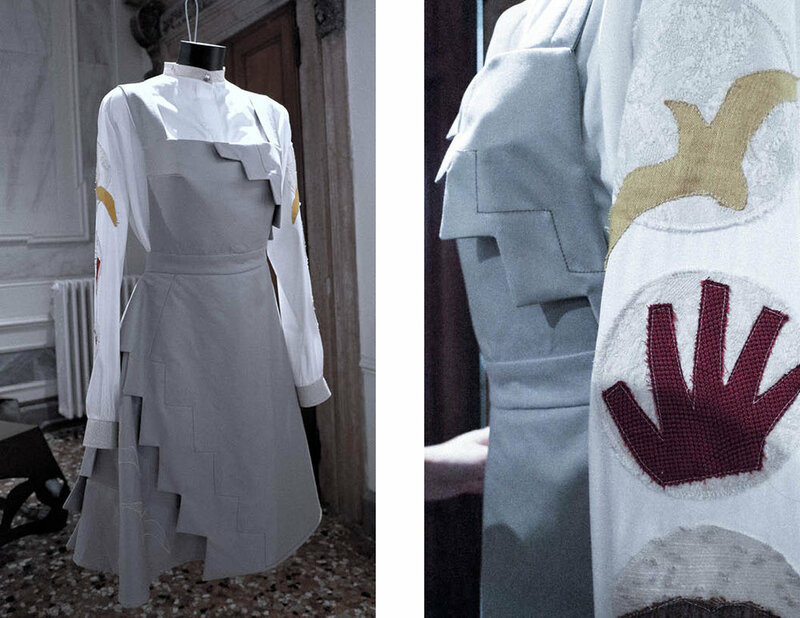 We are so proud to reveal our second collection designed by the Workers from "the sartoria" (textile workshop) of the Giuddeca Prison for Women. Anna, Cin, Maya and Michaela, our collaborators, usually produce elegant clothes for BANCO LOTTO N10, the fashion brand from Il Cerchio, a cooperative giving prisoners the opportunity to gain knowledges in different domains for their professional life after prison. Through this new collection, the girls were able to reveal their inner identity and personality, to dissociate it from the cliche of the prisoner's one. A way for them to manifest their humanity and showcase their real mask to the public. The girls were asked to expose themselves by reconstructing the outfit of the lace maker from Burano, a women workers outfit, representative of Venice. To embellish it, they had the opportunity to use fabric stocks from RUBELLI, one of the oldest and most prestigious Venetian weaving company. The About a Worker team would like to thanks Giulia Pannoli, the creative director of Banco Lotto and Il Cerchio for making this collaboration possible and beautiful! Thank you for all effort, love and compassion you gave towards this new collection, it was the biggest pleasure to work with you over this month. Camille Guibaud and Anais Hammoud the curators from Venice Design who were not only here to showcase our work but who helped us to find the right Venetian collaborator. Rubelli for offering us a variety of beautiful fabrics. And of course our financial sponsor JNBY group, a beautiful fashion brand from China supporting young designers. We could not have made this collection possible without them!